The Oregon State Police provided this photo of the aftermath of a crash in Crook County on Aug. 12. One of the riders was hit from behind. When it meets in Ontario later this month, the Oregon Transportation Commission is set to allocate $2 million toward the construction of a bike trail between Corvallis and Albany. Two crashes elsewhere in Oregon, one of which killed a cyclist, illustrate why this is a sound idea. The scene of a fatal bike crash in Yamhill County (OSP photo). 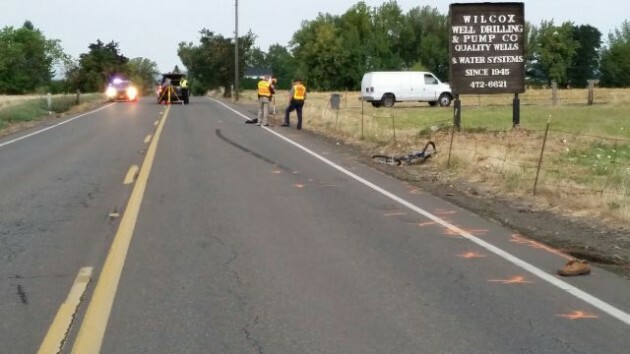 The same day, a little earlier in the afternoon, Frederick Bouwman, 53, from Canada, was riding his touring bike on the paved shoulder of Highway 126 in Crook County when he was struck from behind by the right front quarter panel and side mirror of a 2003 GMC Sierra pickup. He was wearing a helmet, but he was seriously injured anyhow. An air ambulance took him to the hospital in Bend. 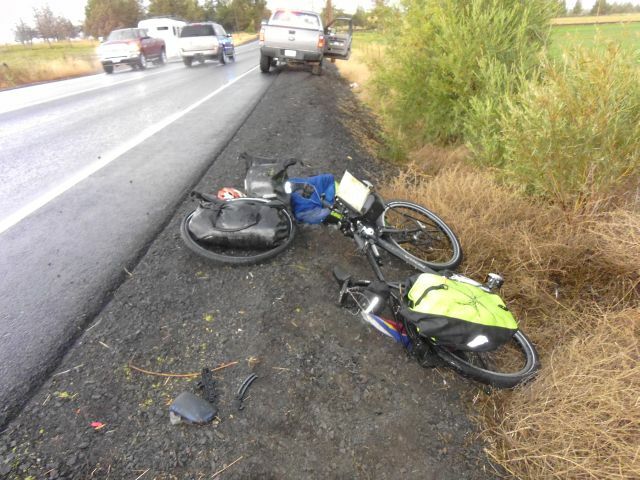 Being hit from behind by fowling traffic — that’s the biggest risk bicyclists face on the highway. Or anyway that’s how it feels when you’re riding along, as far to the right of the fog line on the shoulder as you can, and hear a motor vehicle coming up from the back. Does that driver see me? Is is paying attention? Or is he looking for something in his center console? Or admiring the interesting cloud formation on the horizon? It’s only 10 miles between the city limits of Corvallis and Albany on Highway 20. In reasonable weather, cyclists could easily make the trip on their bikes, saving gas and keeping pollution down. But only a few do. For the others, the risk seems too great. Which of the roughly 20,000 drivers a day will use that day and that moment to become distracted and veer across the white line on the right? At speeds common on that road, the cyclist likely would not survive being hit from behind. That’s why bike advocates and local officials, notably Benton County Commissioner Linda Modrell, have advocated for years for a separate bike route paralleling the road. Bikers should pay a toll to use a new paved pathway built expressly for cycling. Forcing taxpayers who do not bike to subsidize this project is inherently unfair. The price of my house included the system development charge for the sidewalks. When the sidewalk needs repair, I’m on the hook for the cost. Why shouldn’t bikers be on the hook for their use the same way I am for the sidewalks that border my property? Exactly. You pay for the sidewalk, but the pedestrians who use it don’t. That’s my point. Should people who don’t drive pay taxes that go to the highway? Should people who don’t have children pay taxes for grade school? Should people who don’t get injured pay taxes for emergency rooms? My answer is that we are all part of society, and that things that benefit the public should be paid for by the public. If we want to incentivize biking (which should lead to reductions in other public costs based on the reduction in air pollution and the health benefits to the riders), then we should make it as affordable as possible. Just wild speculation, but I believe there may some Albany-Corvallis bicyclists are not well able to pay a toll. Taxpayers who drive between Albany and Corvallis would get the benefit of fewer cars on the road, fewer bikes on the road, more parking spots when the got to their destination, cleaner local air, healthier population, more money staying in their communities rather than sent off to oil companies, etc. Maybe we should make a seperate road for motorcycles too! I’m sure we can get some activist groups together to head the charge! We can demand special rules! Special laws! We could become the next protected species on the road! We want private roads too! And… it will only cost a gazillion dollars! Yup, special access for everyone! That’s the ticket! Thanks for staying with this story. Such a trail would be used for years to come by a variety of cyclers, strollers, skaters, joggers, and pedestrians. It might encourage more exercise among the local population, get a few cars off the road, lessen the risk to both cars and non-car users of hwy 20. It is also a potential tourist attraction as well as enhance retail/living opportunities on both ends of the path. Let’s see now, 20,000 automobile drivers per day on Hwy. 20 between Albany and Corvallis vs. how many bicycles? Maybe 100 to be generous. Are these 100 commuting to work, or simply out joyriding? Do you seriously advocate those 20,000 be taxed to pay for the bicycle lanes which are used so little and for six months of the year virtually not at all. I know how much you enjoy riding your bicycle around town and that’s lovely, but your normally good sense has taken leave of you in this case. When the use of a publicly provided service or good is optional (like a bike path), then user charge financing should be implemented. When the use of a publicly provided service or good is mandated by law, or created as a public monopoly (like police), then financing them with tax funds is appropriate. I am very much in agreement with you HH. I expect there are few 10 mile routes travelled in Oregon that could be of so much potential use by bicyclists. Two cities, very much intertwined with housing and work, a level ride, short enough to be feasible for daily commute, long enough to work in daily exercise. A bike path off the road would be a great use of transportation dollars. I’ve been driving Highway 20 between Corvallis and Albany on an almost daily basis for 30 years (I live in Corvallis and my business is in Albany). I, for one, would be devastated if my attention wandered and I struck and killed a bicycle rider. Is preventing this from happening by segregating motor vehicle and bicycle traffic worth it? Let your legislators know how you think! Using some of the logic presented, why should my taxes pay for parks, cemeteries etc. that I don’t use. Let’s face it. NOBODY is going to be pleased all the time. The source of funding for this project is Connect Oregon…lV…I think. Which in short comes from lottery proceeds. The only taxpayers who are paying for this project are doing so voluntarily. I’d like to add a couple of other points. First, the million dollars a mile for this bike path should be sticker shock for everyone. Following the same rules and process, it is no wonder that the price of doing roadwork has gone completely bonkers and is a primary reason we have no chance of keeping up with the demand. Second, separating bikes and automobiles is a smart idea where practical and despite this investment there will still be cyclists riding hwy 20 as they view it as some type of cyclists civil right. The law as it stands today supports that position. At the very least, the legislature should discuss giving ODOT the ability to remove cyclists from the roadway when a practical alternative exists. It’s Connect Oregon V, as in 5. Thanks for the clarification. The money for this path will indeed come from lottery-funded revenue bonds. I’ll leave the debate about state-sanctioned gambling for another day. Mr. August, I agree with the idea of persuading bicyclists to use alternative routes when they are available. A fine seems like a reasonable persuasion. It is very aggravating to encounter bicyclists riding side by side on narrow shoulders, with one of them on or over the white line. It is as unsafe as it is arrogant. For the record, I am in favor of this path. I think it will be a great asset to both cities, and I would probably even break down and buy a bike to use it if it comes to fruition. Well, that is embarrassing. My previous comment should be addressed to Roger, not Mr. August. Either that, or everyone submitting comments to this post happens to be named August. Small world! Thanks for the update on this project. I share the “sticker shock” concern mentioned by Roger, which applies to just about every public project these days. That aside, this will be a wonderful “public good” project and I believe that the use the path will be far more popular than detractors project. This would be a great investment, not just for the safety of cyclists, but for the reduction in public expenditures every time a cyclist gets hit. If humans lives aren’t your thing, think of the money saved by reducing accidents which incur police, ambulance, hospital, and judicial costs! No doubt: If you build it, they will come. There are drivers who would gladly switch to bicycles if they knew they could cycle those few miles between Corvallis and Albany on a path dedicated to cycling and walking. This would be a wonderful development for both Corvallis & Albany, I fully support it. I understand the project money is coming from lottery sales, so its somewhat of a moot point, but I’d like to chime in that as an avid cyclist, I still pay a respectable share of property and income taxes. I also have to drive quite a bit for my job which translates into registration and gas taxes. I think its somewhat disingenuous to assume drivers and cyclists are two different groups of users and that cyclists are somehow “getting a free ride” on the backs of the auto owners. Often, the two seemingly different user groups are comprised of the same set of tax payers. I am another Albany – Corvallis frequent commuter that would absolutely switch over to bike commuting if I could do it without fear of being hit from behind on my bike at 55mph. And if it would help to win over the whiners, I would pay a fee for use of the path.